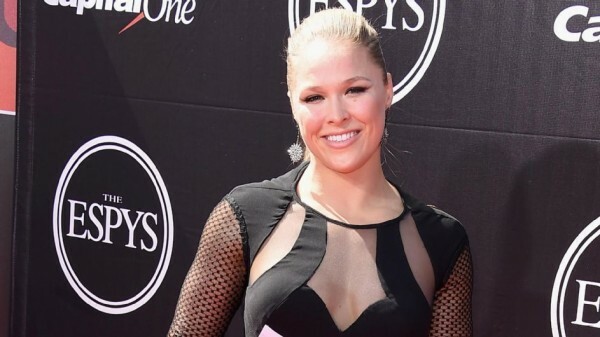 The biggest UFA female star, Ronda Rousey, ended up winning two awards at the 2015 ESPY awards: Best female athlete and best fighter. She had something to say in an interview after picking up the award about Floyd Mayweather and his history of hitting women. The thing about Mayweather isn’t that it’s alleged. At least some of the cases aren’t, and he even went to jail after taking a plea back in 2012. But Mayweather has angered a lot of people by the way he never talks about this, answering things that have nothing to do with the matter when questioned about the subject. Rousey beat Mayweather for the Best Fighter award, and deserved to. She didn’t forget about Mayweather when interviewed about the award. And it also seems like Cardale Jones, the Ohio State quarterback, is trying to date her, or at least get her attention on Twitter.